So, you’ve just put your home on the market… congratulations! Surely, it took a lot of effort to get to this point. You had to find the right real estate agent, clean and declutter your home for listing photos and gain a basic understanding of the selling process. Now that your home has been listed, are you wondering what happens next? Remember how you cleaned and decluttered to prepare for your listing photos? Now that your home is on the market, you never know when an unexpected showing may get scheduled. What that means is that your home should be “show reading” every time you leave the house. Expect to make the beds, put laundry away, pick up toys from the floor and clean your counters before you walk out the door… every time. Once you realize you’ll be living in a museum as your home is on the market, it may be much easier to also understand that your life might be just a bit more inconvenient while your home is listed. As we’ve mentioned, you’ll need to make sure your home is always ready to be shown. 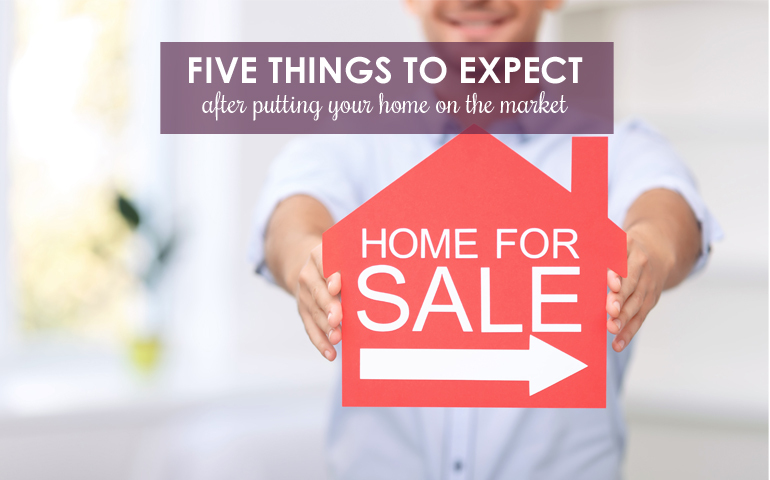 In addition, you’ll need to make sure that you’re being flexible when buyers want to tour through your home. This can mean adjusting your schedule on some nights and weekends to make sure buyers can see your home. If you’re anything like us, you’ve put a lot of work into your home to make it feel like more of your own. When you hear a prospective buyer critique some of the choices you’ve made, it can feel insulting, rather than productive. Don’t take every buyer’s feedback to heart. Know that buyers are trying to envision your home as their own. So, their comments stem from their personal perspective – just as the choices you made for your home have stemmed from your tastes. Hear comments from prospective buyers, but don’t take offense to every critique. In addition to keeping your home ultra clean while it is listed, you’ll need to make sure you’re keeping up with all maintenance tasks. From having your HVAC system inspected for the upcoming heating season to taking care of that last bit of lawn maintenance before winter weather arrives, having your home on the market means you need to be on top of all homeowner maintenance tasks. Once you accept an offer from a prospective buyer, the closing process will begin. For sellers, this could mean paying out a bit more money before their home is sold. If home inspectors find any structural issues, sellers may need to make repairs before a buyer will move forward. If a seller agrees to pay even a portion of closing costs, this could take away from their expected post-sale profits. If you’re ready to put your home on the market, but you have questions about how the sales process might work for you, we can help. Contact us today!